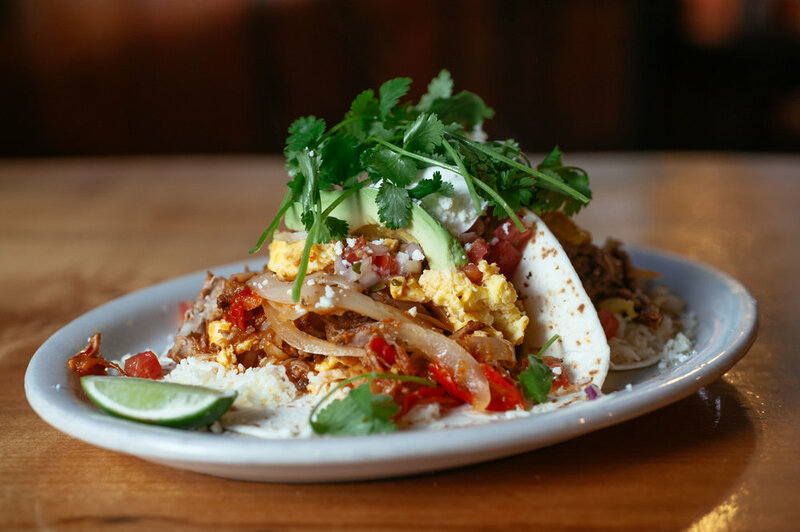 At the Train Wreck, we take pride in supporting other local businesses as we purchase locally sourced products from suppliers throughout the Pacific Northwest. From baking our own breads to smoking our own meats, we create our dishes from the best ingredients and serve it to you fresh everyday! Train Wreck Bar and Grill in Burlington Washington opened in 2008 is a unique place to grab a beer, glass of wine or one of the many delicious cocktails. At the Train Wreck we take pride in supporting other local businesses as we purchase locally sourced products from suppliers throughout Skagit County. From baking our own breads to smoking our own meats, we take pride in making all our food from scratch, and serving it to you fresh everyday! Train Wreck Bloody Mary, Bloody Mary, Breakfast, Train Wreck Bar and Grill in Burlington Washington is a unique place to grab a beer, glass of wine or one of the many delicious cocktails. At the Train Wreck we take pride in supporting other local businesses as we purchase locally sourced products from suppliers throughout Skagit County. From baking our own breads to smoking our own meats, we take pride in making all our food from scratch, and serving it to you fresh everyday! Train Wreck French Toast, French Toast, House Baked Bread, Breakfast, Strawberry, Local, Buy Local, Breakfast, Train Wreck Bar and Grill in Burlington Washington is a unique place to grab a beer, glass of wine or one of the many delicious cocktails. At the Train Wreck we take pride in supporting other local businesses as we purchase locally sourced products from suppliers throughout Skagit County. From baking our own breads to smoking our own meats, we take pride in making all our food from scratch, and serving it to you fresh everyday! Train Wreck Chicken and Gravy, Chicken, Gravy, Breakfast, eggs, Local, Buy Local, Breakfast, Train Wreck Bar and Grill in Burlington Washington is a unique place to grab a beer, glass of wine or one of the many delicious cocktails. At the Train Wreck we take pride in supporting other local businesses as we purchase locally sourced products from suppliers throughout Skagit County. From baking our own breads to smoking our own meats, we take pride in making all our food from scratch, and serving it to you fresh everyday! Train Wreck Beer, Microbrew, On Tap, nightlife, bar, Local, Buy Local, dinner, Train Wreck Bar and Grill in Burlington Washington is a unique place to grab a beer, glass of wine or one of the many delicious cocktails. At the Train Wreck we take pride in supporting other local businesses as we purchase locally sourced products from suppliers throughout Skagit County. From baking our own breads to smoking our own meats, we take pride in making all our food from scratch, and serving it to you fresh everyday! Train Wreck Breakfast Tacos, Breakfast, Tacos, Restaurant, Morning, Local, Buy Local, gourmet, Train Wreck Bar and Grill in Burlington Washington is a unique place to grab a beer, glass of wine or one of the many delicious cocktails. At the Train Wreck we take pride in supporting other local businesses as we purchase locally sourced products from suppliers throughout Skagit County. From baking our own breads to smoking our own meats, we take pride in making all our food from scratch, and serving it to you fresh everyday! Train Wreck Coffee, Coffee, Dark Roast, House Roast, Local, Buy Local, Breakfast, Cup of Joe, Train Wreck Bar and Grill in Burlington Washington is a unique place to grab a beer, glass of wine or one of the many delicious cocktails. At the Train Wreck we take pride in supporting other local businesses as we purchase locally sourced products from suppliers throughout Skagit County. From baking our own breads to smoking our own meats, we take pride in making all our food from scratch, and serving it to you fresh everyday! Train Wreck Breakfast Burrito, Breakfast, Burrito, Restaurant, Morning, Local, Buy Local, gourmet, Train Wreck Bar and Grill in Burlington Washington is a unique place to grab a beer, glass of wine or one of the many delicious cocktails. At the Train Wreck we take pride in supporting other local businesses as we purchase locally sourced products from suppliers throughout Skagit County. 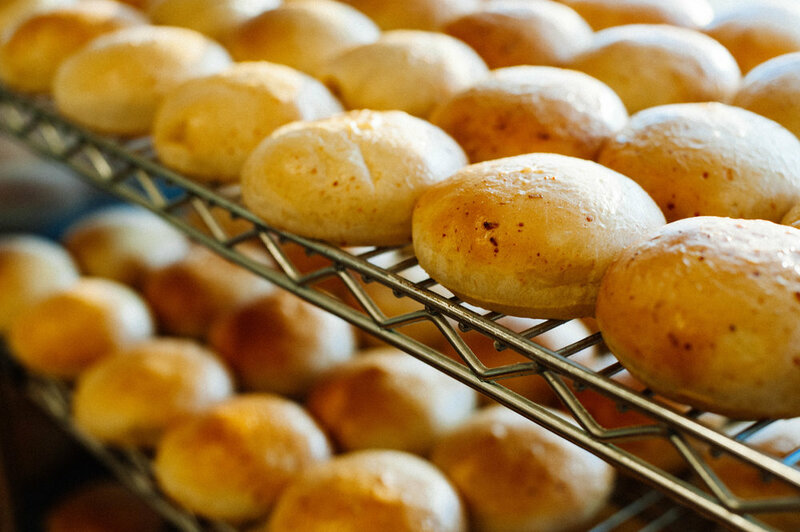 From baking our own breads to smoking our own meats, we take pride in making all our food from scratch, and serving it to you fresh everyday! 8 fried Blau oysters served with aioli & cocktail. Try them sautéed in garlic, butter, wine & fresh herbs. Mixed greens topped with tomato & cucumber, served with your choice of dressing: Ranch. Blue cheese. Balsamic. Lemon Dill. 1000 Island. Honey Mustard. Ginger Soy. House Vinaigrette. Served with your choice of hand cut fries, sweet potato fries, cup of soup, salad, or potato salad. Applewood smoked meats, right here in house. Sandwiches are served with coleslaw & potato salad. All burgers are 1/3-pound natural beef on our house baked parmesan bun. All burgers are topped with lettuce, tomato, mayo & red onion sauce. Served with your choice of hand cut fries, sweet potato fries, cup of soup, salad, or potato salad. Option to sub for gluten free bun. Also options to substitute chicken or veggie patty on any burger! Served with house pico de gallo, sour cream, fresh avocado, cilantro & lime. Warm 14" flour tortilla filled with scrambled eggs, potato, avocado, bacon, sausage, pico de gallo, jack & cheddar cheeses. 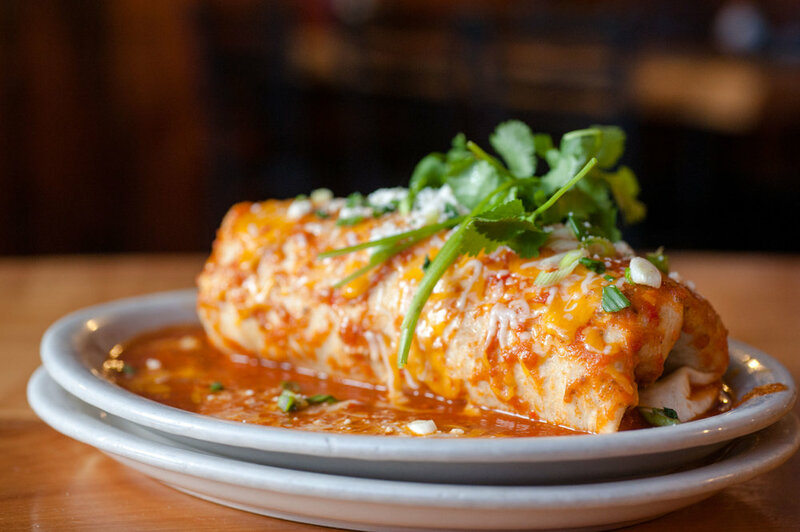 Smothered in house red chili sauce and topped with scallions, cilantro & cotija cheese. Served with sour cream on the side. Flour tortillas filled with scrambled egg, jack and cotija cheese, pepper & onion, avocado, pico de gallo, cilantro and sour cream. Your choice of smoked pork, brisket, steak, chorizo, or mushrooms. Chili verde, smoked pork, scrambled eggs*, potatos, cotija & jack cheeses rolled in a flour tortilla and smothered with more verde sauce. Topped with avocado, scallions, cilantro & cotija cheese. Ask your server for today's selection! Served with your choice of breakfast potatoes or fresh fruit. Double Bloody Mary served with your choice of vodka served in a mason jar with all of the fixings. So much more than just a beverage, it's a meal in a jar. Train Wreck is famous for these things, and we do them right. A double Bloody Mary served in a mason jar and stuffed full. Pick your vodka and we will take care of the rest! Carrot, celery, ham, scallion, salami, Irish White Cheddar, pickled cherry pepper, pepperoncini, blue cheese stuffed olive, apple, dill pickle spear, bacon wrapped potatoes, house sausage meatballs & ham, egg & cheddar breakfast biscuit sandwiches. House, Skyy, Stoli, Hot Monkey, Absolut, Titos, UV Sriracha. Ketel One or Grey Goose upgrade available. Slow cooked corned beef with scallions, cabbage, peppers, onion & potatoes, topped with two eggs* cooked to order. Two slices of house baked bread dipped in our orange vanilla batter. Topped with fresh berries, powdered sugar and served with real maple syrup. 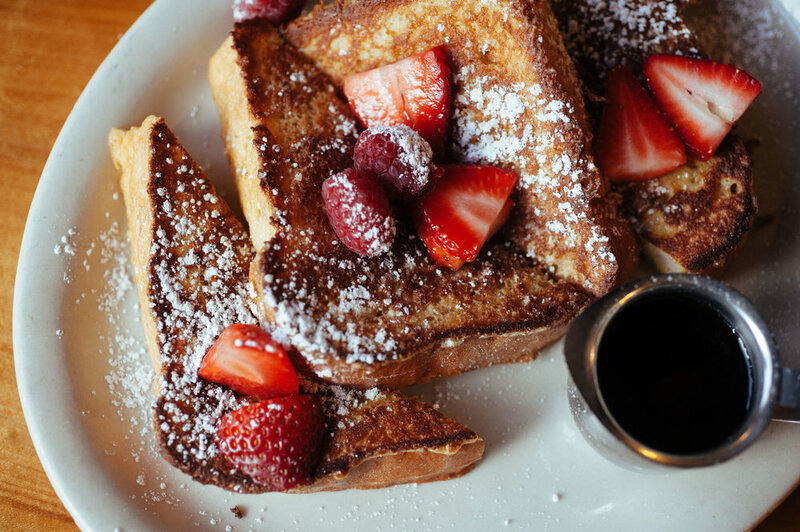 Topped with fresh berries, powered sugar, and served with real maple syrup. We top our buttermilk waffle with boneless fried chicken and sausage gravy. Served with eggs* cooked to order and real maple syrup. Available spicy by request!